The Babies Room is a special place to be. At Kids Steps Academy, our infants received all the love and care they will need to stay healthy and happy. The low teacher-student ratio helps the baby make a special bond with the teacher and develop a sense of confidence between teacher parent and baby. 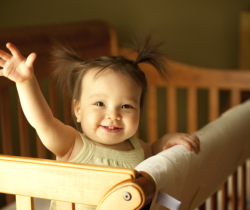 Our infant room is designed to make your baby learn and play in a clean and organize atmosphere.